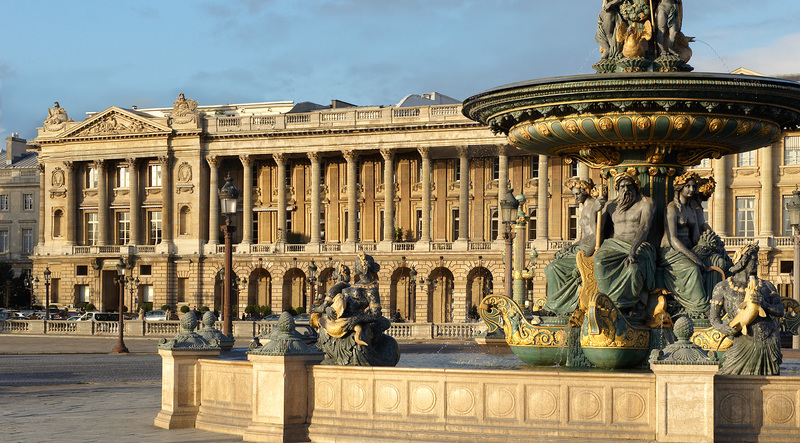 Combining a tradition of French art de vivre, an innovative Parisian esprit and soulful design that bridges the 18th and 21st centuries, the legendary Hôtel de Crillon lets you enjoy an unrivalled position overlooking Place de la Concorde. The Crillon’s new personality is first defined in the lobby and reception area , the domain of Tristan Auer of Atelier Tristan Auer and Wilson Associates Paris. It became clear after interviewing many old customers that the priority was maintaining “the soul of the Crillon, which is Parisian before everything. People expect the famous chandeliers, some tapestry, some tradition.” It only took Auer a month to sketch out his plans for the lobby, which now has higher ceilings and a smattering of distinct, fluid seating areas. He designed most of the furnishings and carpets himself, apparently—even the interior of the house Citroën DS car—turning to myriad craftsmen to help achieve his vision and embracing more than 200 finishes. The hotel is ideally situated in the heart of Paris, near the Champs-Elysées and Jardin des Tuileries, the hotel also just minutes from the city’s most iconic sites. Looking for the check-in desk? Good luck – it’s hidden. Aside from that and away from the grand lobby, the hotel holds three restaurants that is complete with a gastronomic offering. Headlining the offering is the L’Ecrin restaurant headed up by Christopher Hache who’s restaurant hotel (Les Ambassadeurs) earned him a Michelin Star. 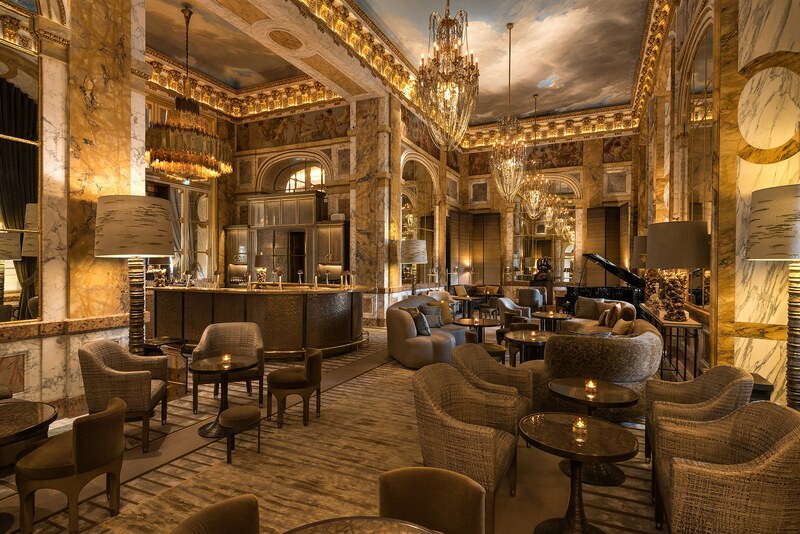 Aside from the L’Ecrin for over the top food, check out the Les Ambassadeurs bar. It’s the place to be seen and sip cocktails or a bottle of the ‘Carte’ prestigious champagnes – while admiring the decorative marble and art work (below). The Grand Premier room (pictured below) is full of supreme comfort with an elegant sophisticated view either on the quiet pedestrian street, Rue Boissy d’Anglas, or one of the hotel’s stately inner courtyards. 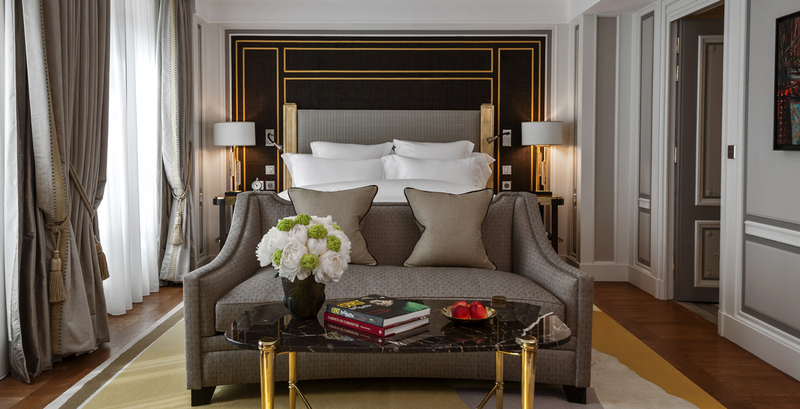 From the first to the sixth floor, the Grand Premier Rooms capture the spirit and charm of a modern Parisian residence with ample space. The large marble bathroom and the choice of one king-size bed or two double beds. Room rates are still more suited to billionaires. If you want to book the connecting Les Grands Appartements suites and salon designed by Karl Lagerfeld, that’ll be €32,000 (£28,558) a night, breakfast not included. To-die-for decoration with the typical snobby Parisian hospitality as you would expect. Sadly the five star performance was not all that. Huge renovation, for such slow yet rude service. Next time I would rather spend my money a few blocks away at The Ritz or may be Plaza Athenee. This entry was posted in Food & Travel and tagged Hôtel de Crillon, Plaza Athenee, Ritz, Ritz Paris. Bookmark the permalink.